Summer holidays or weekend, midweek or winter breaks at any time of year. Vicarage Cottage, Hollinsclough, near Buxton, is part of a lovely period property, the old Vicarage in Hollinsclough. A delightful self-catering cottage with wood-burner and shutters that sleeps up to 5 people in a romantic and beautiful setting in the Peak District. Comfortable, cheerful and attractive are all words used to describe it by visitors. The cottage has two bedrooms, one sleeping up to three and the other being a double. There is also a sofa-bed in the sitting-room.The walks around the cottage are breathtaking. A well-behaved dog is welcome. The Cottage has recently had broadband and wi-fi installed and a satellite fitted for television. It also has a new wood-burning stove and new state of the art radiators in every room. From the door you can take a number of spectacular walks including to the top of two of Derbyshire's best loved peaks. The village is in an incredibly wonderful location nestled under the most peaky peaks of the Peak District. Vicarage cottage is bright and welcoming with comfortable furniture and new beds. Modern heating and a log burning stove have recently been installed together with a satellite box for the TV. The cottage was once the drawing room and bedrooms of the Vicarage and the fire place and various period features including shutters take one back into the early 19th century. It has recently been refurbished and is cheerful and attractive. Hollinsclough is a charming friendly village in remarkable country where the sounds are the distant rumble of a passing tractor, cows and chickens going about their daily life and the stream running down to the River Dove. The primary problem, given that we had 2 young children (aged 3 and 6), was the wood burning stove. Firstly, when we arrived the cottage was cold despite the radiators being on and so naturally we wanted to light the wood burner. Unfortunately we were unable to do this as there was nothing provided to start the fire we therefore had to wait until our cars were unpacked in order to drive to Longnor to purchase the 'clean' wood which was recommended and some newspaper required in order to get the fire started. Nothing was provided to open and shut the fire once started which was a safety problem, neither, a far greater concern, was any kind of guard provided to place and fix in front of it; a huge safety issue with the children coupled with the fact that the sitting room had a very shiny, slippery floor. This floor was also a problem in regard to the two armchairs which are on castors and so were not stable at all unless keeping absolutely still whilst sitting on them. As it is, this cottage is not safe for children and I believe there is an obligation on the owner's part to make the accommodation safe or else state it is not suitable for children. We had to be constantly vigilant in regard to keeping the children away from the burner. The other fault with the cottage was the very poorly equipped kitchen - no serving or oven dishes, and the minimal amount of cutlery and crockery which meant that we had to use the dishwasher more or less constantly in order to have the required amount ready when required. Another safety issue - no oven glove provided which we had to buy and have left for the next people to use. Because of the constant use of the dishwasher we also had to buy dishwasher tablets and when we had to do manual washing up ( as the dishwasher is half-size), only one teacloth was provided. The other kitchen utensils were fairly poor too - one blunt knife, one serving spoon and a mish mash of fairly useless items. No suitable crockery, drinking vessels or cutlery was provided for children . One of the door shelves in the fridge very quickly broke off and it was clear that it had been broken before and stuck with glue. Also one of the freezer drawers was badly cracked. The kitchen floor also became very slippery with inevitable spillages and no available suitable mop provided. The above is quite extensive criticism but essentially it is a lovely cottage, beautifully situated and with some thought could be a wonderful place to stay. We note these comments with concern and will address all these issues immediately. Many thanks. We had a lovely family short break here in October. Great to find a place that is well located, accommodates three children, and has a fireplace. Many thanks to Mark for having us. A nice 4 day break in a lovely part of the country, great spot walks and trips out. A nice cottage in a quiet spot at the end of the summer season. A little tired in places and in need of a bit TLC but nevertheless a comfortable stay. The cooker and shower head needs updating still as mentioned by others. Lounge setting is lovely with nice polished floor. The beds are fine and the heating worked well too. The entrance to the garden hedge was overgrown so walking up the path after a wet days trekking with the dog or when walking him at night was difficult. This is a good cottage in a good location for local walks and trips out but with a bit of money spent on it it could be an excellent one. Many thanks for your comment. All noted and already the shower has been changed, the hedge cut back and a new cooker is coming next week. Beautiful backdrop with several lovely walks from the door. Clean, homely interior with good beds and shower. Excellent WiFi and no issues with parking. Would also strongly recommend Piedaniels restaurant in Bakewell. Best meal we have had in a long time at very reasonable price. This cottage is set in a very picturesque location, but be warned, some of the access roads, although affording spectacular scenery, are single lane and pretty scary in places. There is no parking directly beside the property but there is parking available locally. For anything but very basic groceries, you will have to travel over 7 miles to Buxton. The cottage itself is quite sweet but you will have to watch your head on the door frames if you are tall. Wi-fi in the cottage is good but we had no phone signal. I was disappointed with a number of issues concerning the cleanliness and upkeep of the cottage There was dust so thick in places in the living room that previous holiday makers had actually written a message in it. The shower head was held in place by an elastic band. I don't mind a few cobwebs, but it is not pleasant when they are in the crockery cupboard. More worrying was the fact that the only smoke detector was hanging by wires from the stairwell ceiling; I couldn't reach it to test if it was actually functioning, I feel that, from a health and safety standpoint, it should be easily accessible. The smoke detector has been replaced and the shower head secured. I was grateful to you for pointing out these deficiencies and you can rest assured they were acted on immediately. 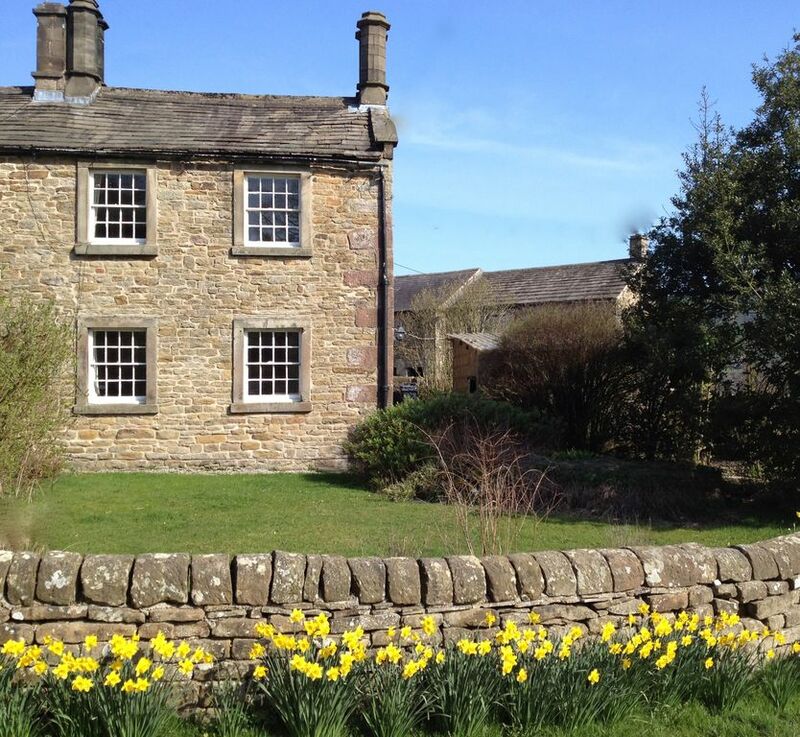 The cottage is situated in the heart of the beautiful Peak District near Buxton. Ashbourne and Bakewell are near by. On one side of the cottage are the spectacular peaks of Chrome Hill and Parkhouse Hill and on the other are heather clad moors of the Staffordshire Moorlands. The market towns of Leak, Buxton, Ashbourne and Bakewell are all an easy drive, each having their own market days. Hollinsclough is beside the River Dove and is a walk away from the village of Longnor which boasts four pubs and various eating places. We book from Friday to Friday.